Maurizio Sarri has backed forward Alvaro Morata to 'restart' his season after his winning goal against Vidi on Thursday. 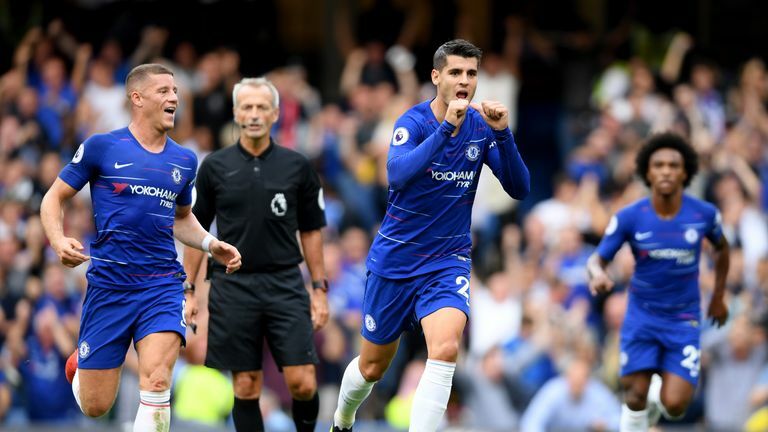 Maurizio Sarri was pleased to see Alvaro Morata's emotional response to scoring for Chelsea in the Europa League, saying he can now "restart" after a difficult spell. Morata has struggled in front of goal this season and missed a brilliant chance to put Chelsea ahead against MOL Vidi when he blazed wide from close range. However, he secured victory for Chelsea with his first goal since August, and appeared emotional afterwards as he hugged team-mate Willian. Asked if Morata had cried after scoring, Sarri said: "I don't know, but if after a goal he wants to cry, I hope to see him cry very often. "I'm really very happy for him. It's very important for him to score. I think it's very important for him to play a very good match. He played a very good match. "It's very important for him to play for the team, like this evening. I think Alvaro can restart from this performance. "He played very well, better than in the last period and so we can restart with this performance. Sometimes you can score, sometimes not, but the performance is important. "For us he's a very important player. At the moment we have Alvaro and [Olivier] Giroud, but we have to play every three days for a long time, I think, I hope, and so he's a very important player for us, for our season. Both, Alvaro and Olivier." Chelsea made it two wins from two matches in the Europa League with victory against Vidi. However, the visitors had chances as Emerson cleared an early header off the line, Loic Nego came close to opening the scoring before half-time and substitute Istvan Kovacs forced Kepa into a full-length save late on. "It was very hard," Sarri said. "In the first half, we had opportunities to score, we didn't take them and so in the second half it was very hard. "It was an important three points, we created a lot of opportunities, but we conceded some to our opponents. We have to do better in the defensive phase and avoid counter-attacks." Vidi manager Marko Nikolic said he had "mixed feelings" after running Chelsea so close, but ending the night with zero points from two games in Group L and looking unlikely to qualify for the round of 32. "I want to congratulate our players and say they played very well and made it a very interesting match for the fans, but we missed too many chances for a game like this," he said. Nikolic was also questioned on whether Gary Cahill should have been dismissed for what appeared a foul on Boban Nikolov before half-time, and said: "It was a questionable decision for sure, if it was given it would be a player down and a penalty or a free-kick for us."